Spicy chilli Cabbage stir-fry(Sri Lankan). Gluten-free, vegetarian and a less than 20-minute dish to prepare, you’ll want to try a Spicy chilli Cabbage stir-fry next time you spot this vegetable at the farmers market. Before moving on to this simple, I mean really simple dish, I just want to write about our meal routine in this family of six. Right now, the biggest ongoing struggle for me is pleasing everyone when it comes to food. From two adults, teens and under twelve to five-year-old, it’s hard to please everyone. 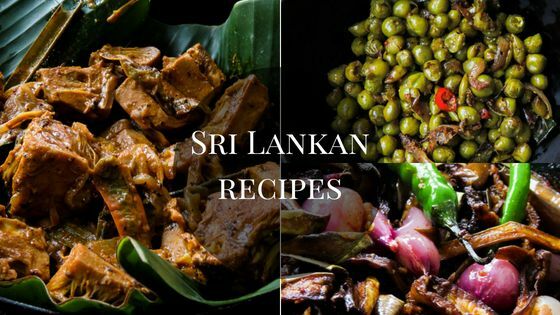 Though kids are happy with some of their favorite dishes, funny guy who absolutely loves the authentic Sri Lankan village type food, rarely finds his favorite in our usual lunch menus. He is kind of forced to have whatever the kids and I want to try which can be a food adventure of sorts. Thankfully, this is where my mother-in-law comes in and our on and off visits gives him the opportunity to indulge in his favorites. This tends to be, a meat curry that can vary from beef, chicken, eggs, Soya, seafood as the main dish and one to two vegetables depending on time and a Salad. This might sound like a lot of work but it’s actually not, this is a typical meal in almost every home here, some might have even more dishes I might say. Dinners are sometimes left-overs from lunch or easy stews or soups like this 30-minute or less corn soup or a pasta dish like a Deep dish pizza spaghetti bake. Then we have the weekends which myself and the kids really take advantage of, for me, these two days are completely reserved for relaxation, do my thing and hand over the kitchen to funny guy, what he does or does not do is up to him because this means the kids go on a two-day binge of their favorite treats or junk food. As a family with growing kids and varying taste buds, this shift between the weekdays and weekend meals from kids favorite to a typical Sri Lankan brings about harmony to our meal times, we get to know what they like and they get to know what we like which makes up for happy tummies and smiley faces. So one of the things I do for lunch time is to keep an eye on what type of vegetables they like to eat, at this point if you are wondering if I’m crazy to be keeping an eagle-eye on what my kids are eating, I assure you, I’m not. It’s a matter of just checking the pans to see what’s left and what’s not touched, again this goes back to teaching the kids good eating habits and not bringing up picky eaters. Like everything else, even food, I’ve realized it’s a give and take thing. If they show appreciation to the food I make by, either finishing it all up or at least giving it a try, I go out of my way to make every meal a good one for them with a few of their junk food included tp their weekend meals. This happened quite a few time, so to make it more kid-friendly and give them something with less gravy, I make this Spicy cabbage stir-fry. My food bribe to make sure they eat it is to make their favorite Pepper beef fry(that give and take thing I was writing about)with a raw salad on the side. *Hi! Can I use curry powder instead of curry leaves? If so how much do you recommend I use? I would suggest NOT to use the curry powder as the taste would completely change. You can make it without the curry leaves. try using herbs that you already have if you are not able to find the curry leaves. *Can you substitute dried curry instead of curry leaves? 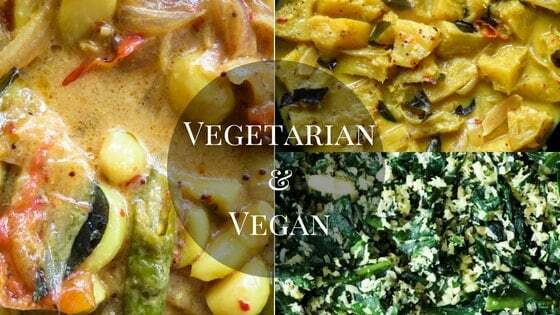 If you are substituting with curry leaf powder then yes, not curry powder. If you are unable to find curry leaves simply substitute it with 1-2 Bay leaves. *Added this into my usual tofu stir-fry, and it worked perfectly. 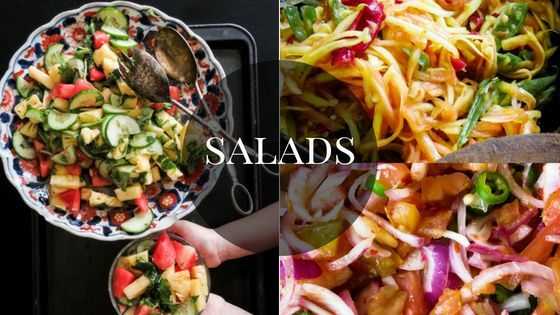 * loved this basic recipe, but I added so much! Green peas, shredded carrot, Gardein Teriyaki “Chicken” strips, White onion, and mushrooms! *Used the leftovers to make scrambled eggs and that was so good! *I added peas and carrots as well and served over some cauliflower rice! I added curry powder instead and some extra turmeric! Great dish! *I decided to add a side of shrimp and rice with the same seasoning ingredients as the cabbage and it was the ultimate. *I added peri peri chicken and Mexican rice..absolutely gorgeous! As you can see, this recipe is simple yet so versatile and the best part is you can do this in a skillet like this or a frying pan. 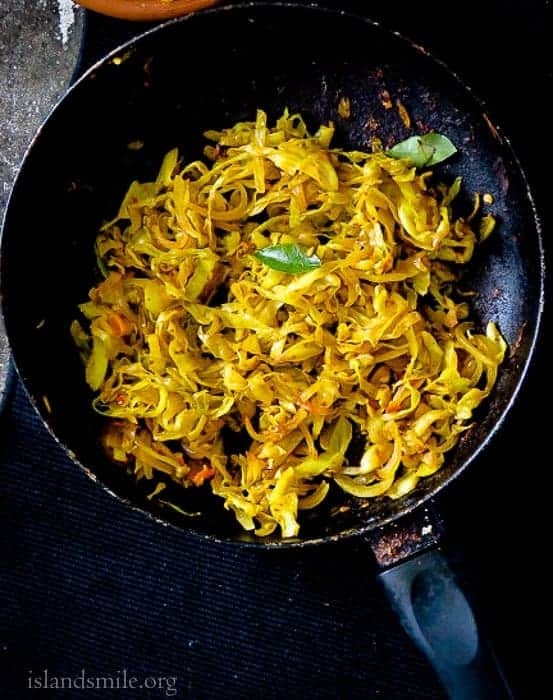 Notes- Though the following recipe is given as a how-to, in making a spicy cabbage stir-fry, you can certainly add your own spin to it and if you find that the stir-fry bland to your taste, season with Salt as per your requirements. Slice the Cabbage, Onion, Garlic and set aside. Place pan over low fire(preferably a non-stick pan), sauté the Cabbage until they wilt and there is no moisture left in the pan. 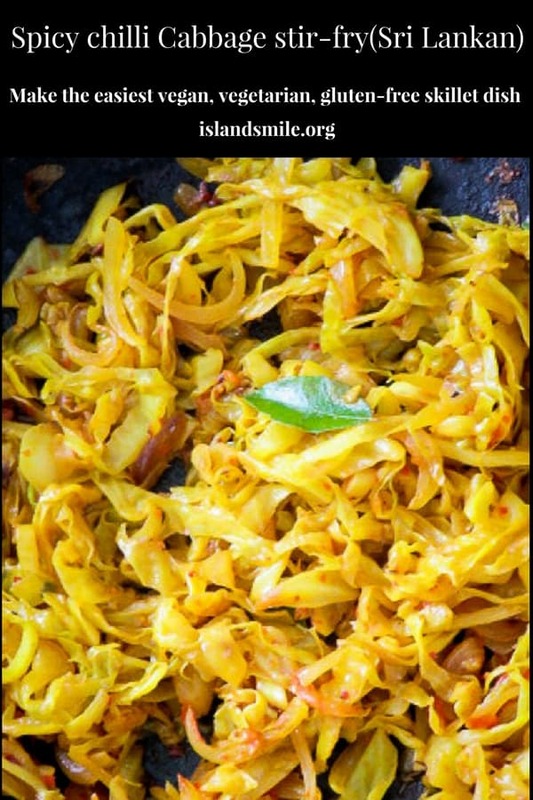 Once the moisture from the Cabbage has evaporated, maintain low fire and pour in the oil, add the sliced Onions, Curry leaves, Garlic with Turmeric powder and Salt to taste. Cook for at least five minutes until you see the Cabbage edges slightly burn, take the pan off the stove and with the remaining heat, add the chilli flecks and mix it into the Cabbage stir-fry. Taste and season with Salt if necessary, to further enhance the taste, drizzle a bit of lime juice and mix. Serve warm over rice or your preferred main dish. 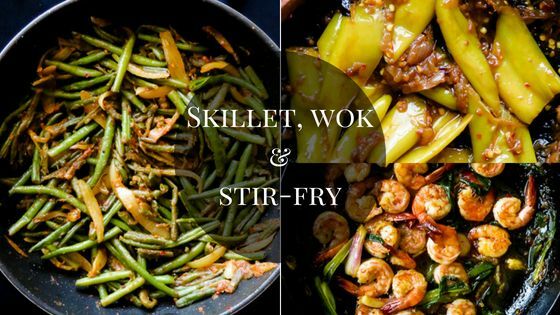 Here are a few other vegetarian skillet stir-fry recipes you can try. Potato, spring onion basil chilli stir-fry. Sri Lankan Lady’s fingers stir-fry(okra,bandakka). Easy kangkung(water spinach)stir-fry with toasted garlic. Oyster mushroom green bean stir-fry. Sri Lankan capsicum and onion stir-fry. Nutritional information on islandsmile is provided as a courtesy. We cannot guarantee the accuracy of the nutritional information given for any recipe on the site. these figures should only be considered as estimates. Each recipe on this blog has been written with great care and love towards any reader who wants to try them. It’s free and on the blog, for you to try anytime. I HAVE to try this! It looks so good! hello friend, sorry for the delay in replying. hope you are well and thank you. Can I use curry powder instead of curry leaves? If so how much do you recommend I use? Hi Stephanie, apologies for the late reply. Hi Jehan, I just found your blog. Your blog gave a smile to my face, it’s simply gorgeous. I don’t know if it’s the delicious food or the breathtaking photos. This cabbage dish looks so flavourful and so delectable. Thanks for sharing the recipe. THANK YOU! this is the most popular recipe on the blog so far. I’m amazed how many people like cabbage and I’m so happy the blog is making you smile. Can you use the red cabbage or does that change everything? I don’t do a lot with cabbage, so I don’t know about the difference. can you substitute dried curry instead of curry leaves? Hi JoAnne, if you are substituting with curry leaf powder then yes, not curry powder. If you are unable to find curry leaves simply substitute it with 1-2 Bay leaves. 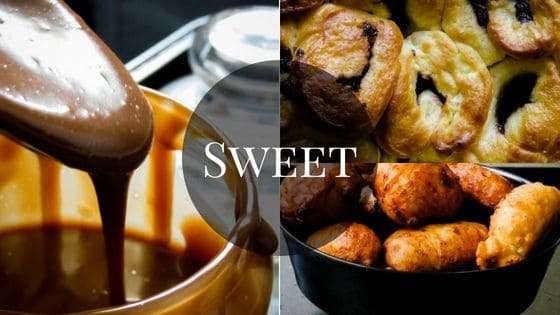 Hi Nauni, glad you found the recipe tasty, it’s such a simple recipe but highly customizable to individual preferences. and thank you for the rating, not everyone spends a few seconds rating it. I need to try your version, I think my kids will love it. This is delicious! Thank you for the recipe.